How important is graphic design in your website’s success? It’s possible to make sales from a website with absolutely no graphics at all, if you write a persuasive enough sales message. Nevertheless, graphics are very important. A study by Stanford University found 47% of people make a decision on whether to buy from a website, based solely on the appearance of the site (essentially its graphic design). This implies that if your website looks attractive and professional, nearly half your cus­tomers will immediately feel comfortable about doing business with you. For an e-commerce website, where you are trying to get people to pull out their credit card and buy directly from the site, a picture really is worth 1000 words. How good a product LOOKS has a huge impact on how well it SELLS. Imagine you went to an online store selling clothing, and they described the clothes in detail but offered no pictures – would you buy from them? Not likely. Taking that to the next step: if the shop had pictures, but they were obviously shot with a cheap digital camera, and the model wearing the clothes was unattractive, would you buy? Again, not likely. That’s why every successful online store selling clothes has attractive-looking models and professional photography. While this is obviously true for items such as clothing, a lot of businesses forget that it’s just as true for any product online. Your prospective customer wants to see every possible detail of the product they are think­ing about forking out their hard-earned cash to buy. As I keep reiterating, trust is so important in closing a sale, and having a fantastic looking site with fantastic-looking photographs of your product will help you win that sale from a lot more people. Of course, a great picture has to be backed up with a great product for long term success. But if you don’t have a great image, a lot fewer people will be willing to buy from you no matter how good your product is. 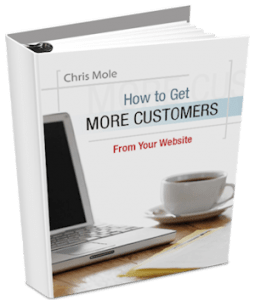 Research has found most people searching for products or services on the Internet will make a decision within about 10 seconds of landing on the site, whether they like it enough to stick around. In this brief time, it’s possible to get a “feel” for a website. People will either feel they are in the “right place” or they will feel a sense of anxiety or unease about the website and quickly click away. Much of this initial impression is based on the website’s graphic design and colour scheme. If you have doubts about the way your current website looks and “feels” to your visitors, the simplest way to find out is to ask friends and colleagues for their honest opinion. Ask them to look at your site and also some of your competitors’ sites and be brutally frank about what they think. put the most important ‘calls to action’ in the right place to attract visitors’ eyes. Good graphic design is too important to your website’s success to risk an amateur look and feel. Good graphic designers may charge up to $100 per hour (a decent plumber can also charge that much). When you understand how great graphics can boost your sales, it’s worth it. Make the investment. Research has proven beyond doubt that black text on a white background is best for read­ing online. If your aim is to get your message read, then don’t deviate from this tried and true combination. Ask yourself this. What colour is a newspaper page? White. And what colour is the text? Black. Okay, it may not be very “creative” but there’s a reason for it. It’s the easiest to read. There is some evidence from recent studies that very dark grey text (#0C0C0C if you un­derstand HTML colours) may be slightly easier to read than pure black. But either way, black (or nearly black) on a white background is definitely the way to go. That’s not to say that all the background of your website has to be white, just the part that your text goes on. Remember, your goal is to get your page read so you must make it as readable to your visitor as possible. Stay away from coloured backgrounds because they place more strain on your reader’s eye so are less likely to be read. And if your copy does not get read, you cannot make a sale! Web marketing experts have done fascinating research into how people read web pages. People first read in a horizontal movement, usually across the upper part of the content area. This forms the top bar of the F.
Next, they move down the page a bit and then read across in a second horizontal move­ment that typically covers a shorter area than the previous movement. This additional element forms the F’s lower bar. Finally, people scan the content’s left side in a vertical movement. Sometimes this is a fairly slow and systematic scan. Other times, people move faster. 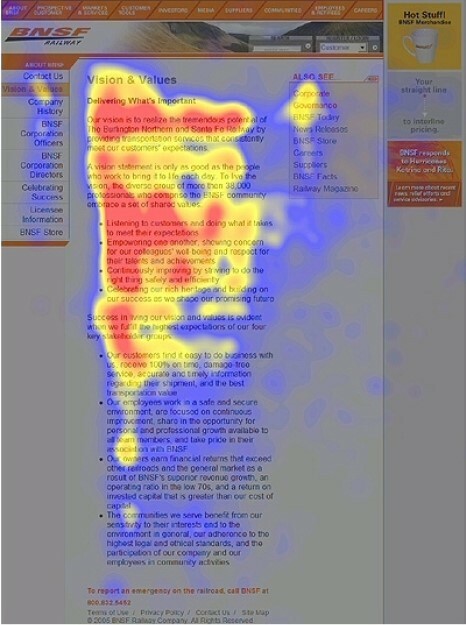 The ‘heat map’ above shows how readers’ eyes scan web pages in a F–shaped pattern. The red areas of the page get the most attention. So, what does the F Pattern mean? Firstly, it means the way people scan web pages is different to the way they read printed pages. So you shouldn’t simply duplicate your print materials on your website. People will not read your text thoroughly, word-by-word. They will very rarely read eve­rything on a web page, especially when they are doing their initial research into which product or service to buy. This means, the first two paragraphs on your web page must state the most important in­formation. Then there’s some hope that your visitors will actually read this material. They will probably read more of the first paragraph than the second. So put a compelling headline on your page, which spells out the main benefits of your product or service. You should also use sub-headings and bullet points, so people will notice them as they scan down the left of your content in the final stem of the F.
Here’s a handy check list to help quickly improve the “selling power” of your landing page. Go through these 12 points to make sure you haven’t overlooked anything that could sig­nificantly boost response. Does your headline speak directly to the key emotions your prospect is feeling? Do you have a clear, compelling offer that appeals to your target market? Do you have a relevant picture (or better still, a video) near the top of the page to help grab your visitor’s attention? Have you used sub-headings throughout your copy, which tell a complete sales mes­sage on their own, if someone scans them? Have you used short sentences and paragraphs for easy reading? Have you clearly spelled out the main benefits of your product or service, and have you woven these benefits throughout your page? Have you written with enthusiasm, while avoiding hype? Have you included testimonials, which clearly point to the results you have achieved for your customers? For each testimonial, have you included the person’s picture, full name and other details? Have you included as many other “proof elements” as possible, such as case studies? Have you used visual elements, such as arrows and boxes, to direct your reader to take action (such as click a button or subscribe to a newsletter)? If you are selling directly from your site, have you included a solid and convincing guarantee that removes all the risk of purchasing?